The 2014 IFBB Arnold Classic & Arnold Sports Festival are both Presented by Classic Productions. Celebrating the 26th Year of the Arnold Classic. The Arnold Strongman Classic was part of the 2014 Arnold Sports Festival and the 26th Arnold Classic event. The first 4 events took place on Friday, February 28th at the Fitness Expo at the Greater Columbus Convention Center. The final event was staged at the Arnold Classic Finals on Saturday night, March 1st, at the Veterans Memorial Auditorium. This was the last time that the Arnold Classic and Strongman Finals will be staged at the Veterans Memorial. The events are designed to test brute strength and determine which competitor is the strongest man! New world records were set, and the exciting final event, the CYR DUMBBELL LIFT, was held on the Veterans stage in front of a packed house. 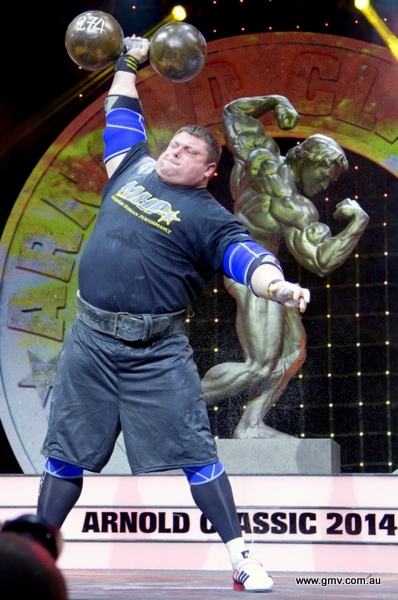 The popular winner, ZYDRUNAS SAVICKAS of Lithuania was presented his award by Arnold Schwarzenegger. See the ARNOLD STRONGMAN CLASSIC PHOTO GALLERY. The DVD includes the COMPLETE ACTION from all five events: THE AUSTRIAN OAK, THE BALE TOTE (YOKE), TIMBER CARRY, THE TIRE DEADLIFT and THE CYR DUMBBELL LIFT. See the Description of Events below. The events held at the Expo stage were shot with standard definition cameras. The final event, the CYR DB LIFT, was shot with HD cameras at the Veterans Memorial stage. Enjoy a packed DVD of approximately 3 HOURS from the Prejudging and Finals of the Arnold Classic Pro Women's Events. Plus a huge numbers of EXTRAS. This disc contains the COMPLETE PREJUDGING followed by the FINALS for each class, seen in this order: FIGURE, FITNESS & BIKINI. Plus all awards and Arnold’s presentations to the winners from each of these events. The 3 International Winners were: Figure International: Candice Keene – USA, Fitness International: Oksana Grishina – Russia and Bikini International: Ashley Kaltwasser - USA. From the Floor to Arms’ Length Overhead for Max Reps. Two logs are used. The Heavy Oak weighs approximately 200 kg/441 lbs; the Lighter Oak weighs approximately 172 kg/379 lbs. The log cannot be stood up on one end and rocked over onto the shoulders. The “Oak” was designed and built by Steve Slater, a Co-director of the Arnold Strongman Classic, as a new challenge for the competitors and as a way to honor Arnold Schwarzenegger, who has been called the Austrian Oak since his early days in bodybuilding. The “Oak” must be returned to the floor on each repetition and it must be lifted to arms’ length and held on each rep until the referee gives the “Down!” signal. There will be a 90 second time limit. This year the yoke weighs approximately 550 kilos/1223 lbs for the first of three heats. Each bale of cotton weighs over 400 lbs (182.5 kg. The yoke which will carry the cotton bales and any additional weight we need was designed and built by Ian Mclean of Rogue Fitness. The men carry the yoke a very short distance (approximately 3 meters/10 feet) and each man must carry it the full distance on each attempt in order to qualify for the next heat. On the second attempt, up to 100 kg/220 lbs will be added to the yoke and each man who successfully carried the first weight will go in the same order and attempt to carry the heavier yoke the same distance. The approximate weight of the yoke plus the two bales of cotton was 1325 lbs/603 kg. and this weight was used in the second heat. Anyone who failed to carry the yoke the full distance will not attempt the next weight but will be judged on how far he carried his last attempt. The first two heats must be completed within 30 seconds, but the men who have qualified for the third heat will be timed in that heat to determine the winner and the top finishers. Placements will be determined by a combination of distance and speed. This item was designed by Terry Todd, built by Hugo and Jonathan Hemme of Texas, and adapted through the years by Steve Slater. This year it weighed approximately 882 pounds (400 kg) and it was carried approximately 35 feet (9 meters) up the same ramp used in recent years. No straps are allowed, and no sliding of the Frame is allowed. The bar can be dropped and picked back up again. Only chalk can be used to help the grip. The time limit is 30 seconds. One Rep Max, as done every year since 2003, when the ASC introduced this unique bar, which is approximately 14 feet long and uses as barbell plates up to eight Hummer Tires, each of which weighs approximately 110 pounds (50 kg). The bar was designed by Tom Lincir and built under his direction at the Ivanko Barbell Company. The event is organized like a deadlift in a powerlifting contest, with a “rising bar” and three attempts for each man. Straps are allowed and so is “hitching,” but at the finish of the lift the body of the competitor must be fully erect. Time Limit of 30 seconds per attempt. Louis Cyr was a famous French Canadian strongman with a career spanning the late 19th and early 20th centuries. He was a physical phenomenon. This year the Arnold Strongmen had an opportunity to test themselves against Cyr’s freakish strength. The replica of the Cyr Dumbbell was designed and built at Rogue Fitness, one of the major sponsors of the Arnold Strongman Classic. Competitors have 1.5 minutes (90 seconds) from the time their name is announced and the whistle has blown to lift the DB from the floor to overhead, as many repetitions as possible. See Zydrunas in action right. Photo by Gallasch.